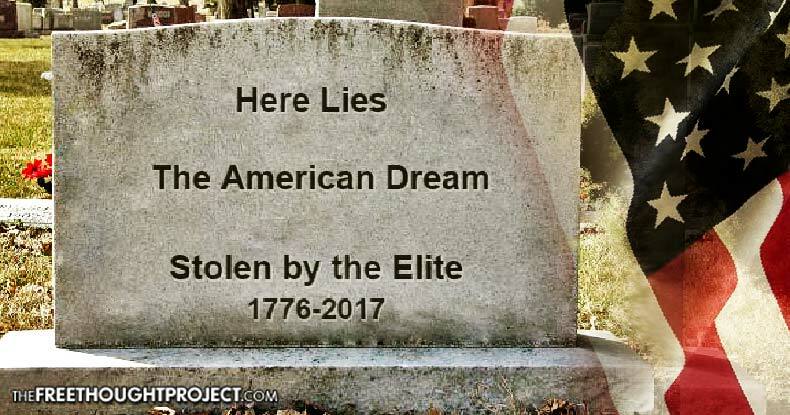 Long the stuff of sardonic quip, it’s finally official: the putative American Dream — an iconic, white picket-fenced, rise-to-the-top-from-nothing bastion of hope for citizens and foreigners, alike — is officially dead. In no small irony, the study divining what the vast majority of cynical Americans already knew came from the St. Louis Federal Reserve. For a person to go from ‘rags to riches,’ in other words, has become nearly impossible in America — upward mobility is now as quaint and anachronistic as a Norman Rockwell painting. While these percentages appear generally low, Chetty points out that, because you literally can’t have more than 20 percent of people in the top 20 percent, the otherwise slight differences in economic mobility between nations in actuality represent stark contrasts. “One way to think about it is this: your chances of achieving the ‘American Dream’ are almost two times higher if you grow up in Canada relative to the United States,” he explains. Apparently the American Dream requires a name change. 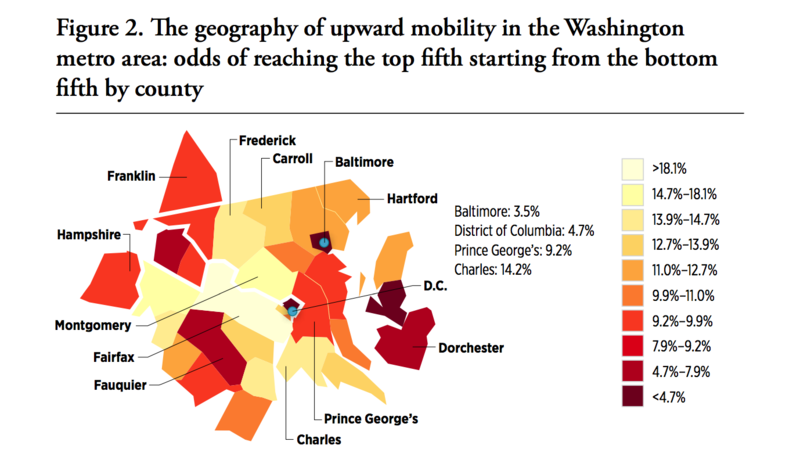 For the study, Chetty and colleagues analyzed economic mobility by U.S. county — and the resulting mapped data evinces pronounced disparities not only by region, but in several places, by counties in the same metro area. Americans in the Southeast have the least overall opportunity to rise from the bottom fifth in income to the top — at just 4.8 percent, the number is “lower than any other developed country” the researchers examined — while a swath through the Great Plains, south to Texas, and, to a lesser degree, the West, appear to offer the most optimistic chance for such an economic leap. 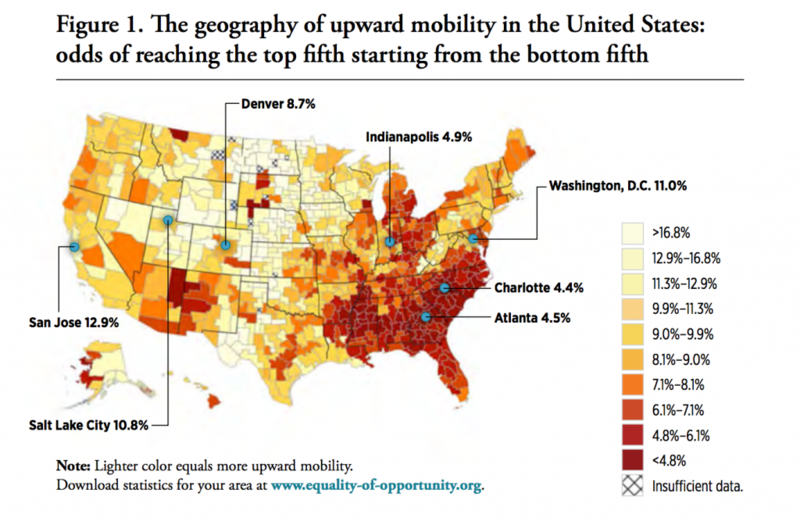 “Now, naturally the question of interest both to academics and policymakers is why does upward mobility differ so much across areas and, ultimately, what can we do about it?” the author queries. Low income, alone, does not predict an inability to move up the economic ladder — rather, several additional factors come into play which can cancel out the disadvantage of beginning in the bottom fifth of income. “More mixed-income communities tend to produce better outcomes for kids from disadvantaged backgrounds,” and “areas with less income inequality tend to have higher rates of upward mobility,” the researchers found. Mitigating circumstances mean certain regions literally aren’t conducive to pulling oneself up by the bootstraps, as has often been criticized of the economically disadvantaged. That level of success — achieving income in the top quintile — cannot be achieved if all of the necessary conditions aren’t in place, as is the case in many areas of the U.S.
From the time children first attend public school, indoctrination into the system includes surreptitious cheerleading of the American Dream — but what once seemed attainable for any starry-eyed dreamer is in reality every bit as elusive as a leprechaun’s pot of gold. No matter one’s fortitude or dogged determination, if all the tools necessary for success aren’t available, that American dream remains a simple rumination.